On New Year's Day I made my family their first batch of Hoppin' Johns. Black eyed peas at their best. I grew up eating black-eyed peas. My grandfather was from the South and it was a staple, along with chicken fried steak and fried okra. Two things that I still love to this day but don't eat much of. I followed a recipe the first time I made the dish. My kids did not find the flavor too appetizing. This was okay because it meant more for Cory and I. We loved it! It made such a simple snack and quick lunch. It reheated like a dream in the microwave. The best part about this dish is that I was able to make it in the crock pot…SCORE one for the easy team. 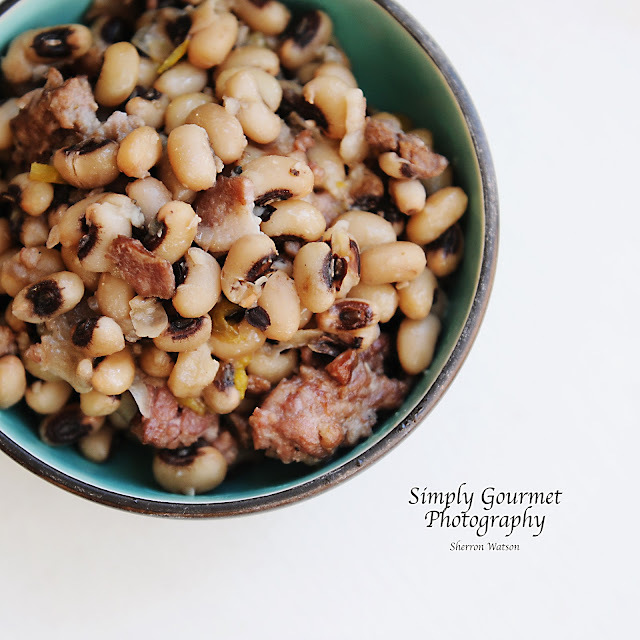 I don't remember how our black-eyed peas were prepared as a kid, I just know I ate them. I talked to my Mom, who HATES black-eyed peas. I couldn't imagine someone feeling this way about a cute little bean. I then found out that the only way she had eaten them, and apparently me too, was straight from a can. A CAN…with all of the slime, she said. No wonder she did not like black-eyed peas. She will be visiting me this summer and I will make her a batch of this to see if her opinion will change. In this case, fresh is best people. Don't settle for a can of black-eyed peas. They take no time to cook, similar to a split pea. The fun part of this recipe is the sausage. You can use any type of sausage that you like and it will enhance your peas to that flavor. I like to buy my sausage at Whole Foods in the meat department. They have a huge selection. I just remove the sausage from the casing before I fry it up. Enjoy this recipe, I know I will be again soon. Saute the onion, garlic, celery and bell pepper for 5 minutes. Cook the sausage and bacon. Add all of the ingredients to the crock pot. Cook on high for 4 hours. Most of the juice will be gone, you may have a cup left. Serve immediately. The minute I saw the name of this dish I knew There was a southerner in your background. Around here, everyone has these and ham hocks for New Years to bring good luck. psst-I've never had them before. Will have to give it a try now that you've made them look so yummy! Joan, You are always so good to comment and leave me feedback. I feel terrible because I have been replying to everyone's comments with the general reply button instead of replying to each post ( I am always in a hurry and I guess I just never paid any attention). SO, I am going back to older post and just letting you know that I am so thankful that you have taken the time out of your day to leave me a quick comment. I learned about Hoppin' Johns when I posted Japanese red rice for New Years. I heard people in South makes this for New Years. I didn't know that until now (and I'm in the US for 15 years!). Looks delicious. I wish to have a chance to eat this one day. Nami, I feel terrible because I have been responding to all of your awesome comments on my blog with a general reply. I did not realize that each comment has their own reply until I had someone ask me why I never comment on their comments. I felt terrible of course and I am now going back and personally letting all of my friends know that I SO appreciate feedback and all of the responses to my little bits of foodie love. Have a fabulous day!